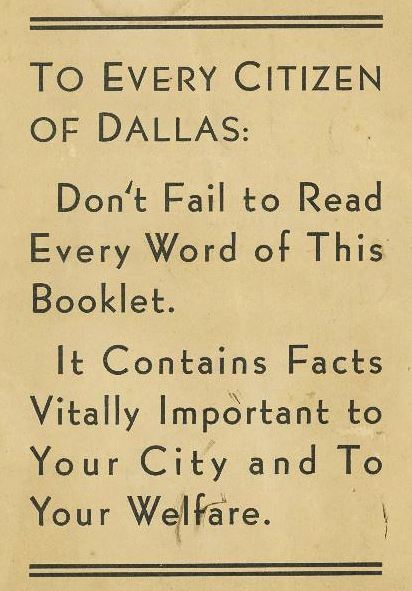 With all the heated discussion currently going on about what the city is going to do with Fair Park, I thought this little pamphlet from 1934 seemed timely. 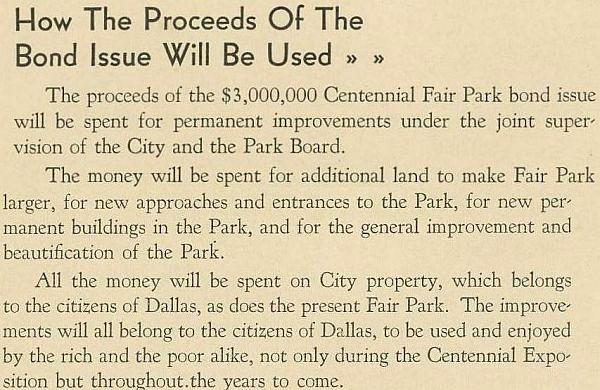 Published by the “Centennial Fair Park Bond Committee” (comprised of all the Dallas movers and shakers one would expect), the get-out-the-vote brochure was issued to explain the $3,000,000 (about $54,000,000 in today’s money, adjusted for inflation) bond issue, the approval of which was essential in order to clinch the honor of hosting the Texas Centennial Exposition in 1936. The entire pamphlet — part of the George W. Cook Collection in the DeGolyer Library — may be read on SMU’s website, here. The issue passed, overwhelmingly, by a 5-1 margin. It’s interesting to note that the voting restrictions on this referendum were … pretty restrictive. Not only was payment of a poll tax required to vote (…one had to pay for the “privilege” of voting…), but one also had to be a property owner — and that property owner was not allowed to vote until a “rendition” was signed downtown in the tax assessor’s office. Many property owners who had signed the necessary paperwork were still unable to vote as they had not paid (or could not afford) the poll tax. It’s pretty obvious here that a substantial number of lower income residents (i.e. non-property owners or property owners unable to afford the poll tax) — including many who lived in the area immediately surrounding Fair Park — were legally prohibited from casting a vote. 6,550 ballots were cast (5462-1088), which represented “little more than one-third of the 18,000 supposed qualified to decide this important issue” (Dallas Morning News, Nov. 1, 1934). It was declared to be “the largest majority ever cast for a bond issue in [the] history of Dallas” (DMN, Oct. 31, 1934). The passage of the October, 1934 bond issue assured that Dallas would host the Texas Centennial Exposition, a statewide celebration which proved to be a huge success and was a tremendous economic boon to the city. 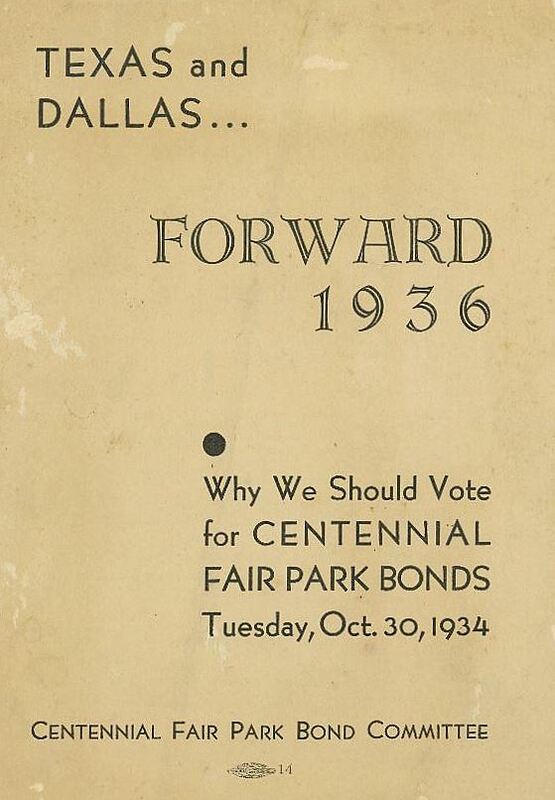 The pamphlet “Texas and Dallas … Forward 1936: Why We Should Vote For Centennial Fair Park Bonds, Tuesday, October 30, 1934” is part of the George W. Cook Dallas/Texas Image Collection, DeGolyer Library, Central University Libraries, Southern Methodist University; the entire pamphlet is contained in a PDF which may be read and/or downloaded here. Payment of a poll tax was still required to vote in Texas elections until 1966, when the U. S. Supreme Court ruled such taxes were unconstitutional. More about that from the Dallas Public Library, here.